In an effort to find something super tasty for dinner with Lady Luck, I found this – pulled from BunsInMyOven.com, a blog I read all the time. There, it was called Roasted Vegetable Enchiladas, but after careful deliberation, we decided that lasagna is layered, and enchiladas are rolled. This dish is layered. Therefore, it can’t be an enchilada. There are so many veggies in this dish it’s ridiculous! There’s cauliflower, three types of peppers, two types of potatoes, corn and spinach. Oh yeah, there’s also cilantro infused salsa, tortillas and sooo much cheese! I love it! It’s spicy and crunchy and savory and amazing! Lady Luck was doing back flips over the flavor. This is so simple too! Chop up all the veggies, and roast them with olive oil, cumin, salt and pepper in a dish for 30 minutes. 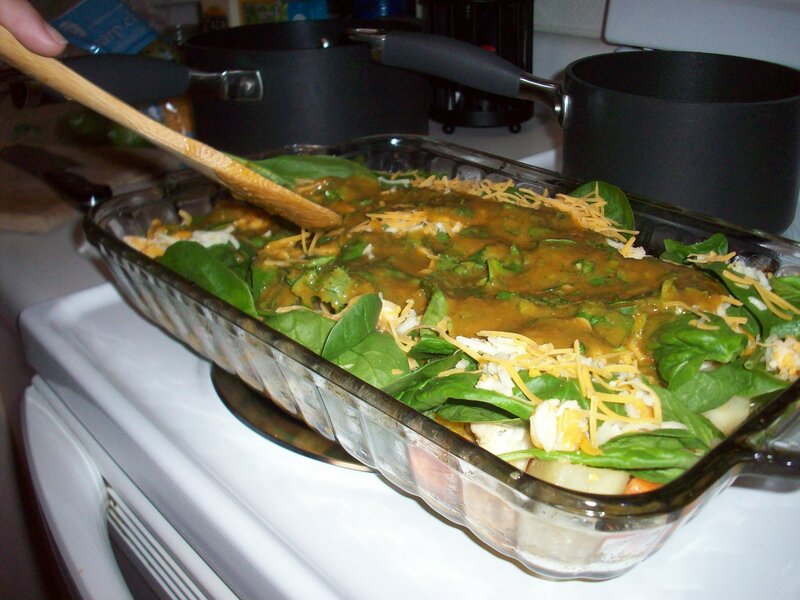 Then layer in a casserole dish starting with the cilantro infused salsa (we actually used salsa verde), then cheese, then veggies, spinach and corn tortillas. Repeat process. Simple, right? 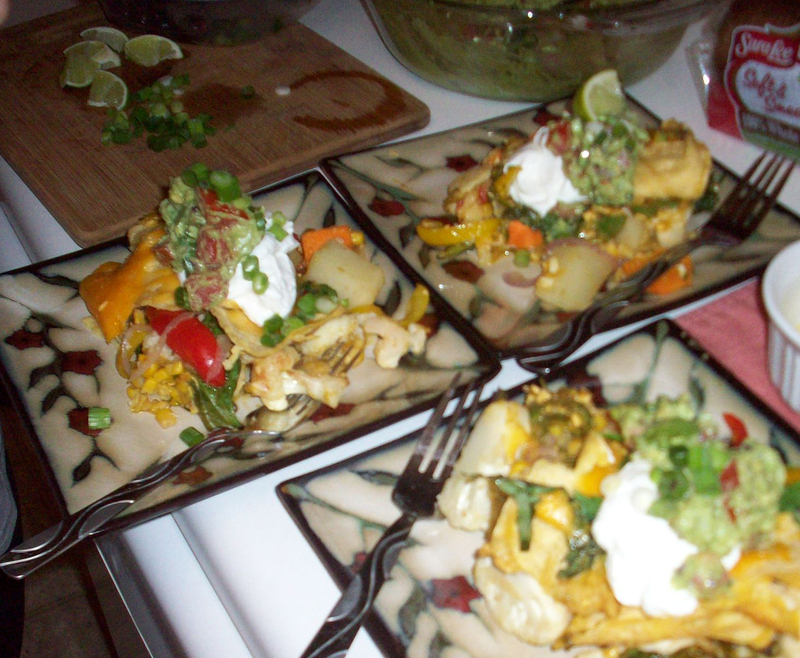 To go on top, we made up some guacamole, and got some sour cream, and topped it with green onions. I’m pretty sure Lady Luck and her daughter couldn’t wait to dig in again the next day because I got a very happy text message. For dessert, we put together a twist on sopapillas, and it satisfied the sweet tooth rather well. Mix an 8 ounce package of sour cream with a cup of sugar and some vanilla extract. Open a tube of croissants, roll it all out together, and then layer the cream cheese and put another rolled out layer of croissants on top. Pinch the edges together, top with melted butter and cinnamon sugar and bake until golden at 350 degrees. 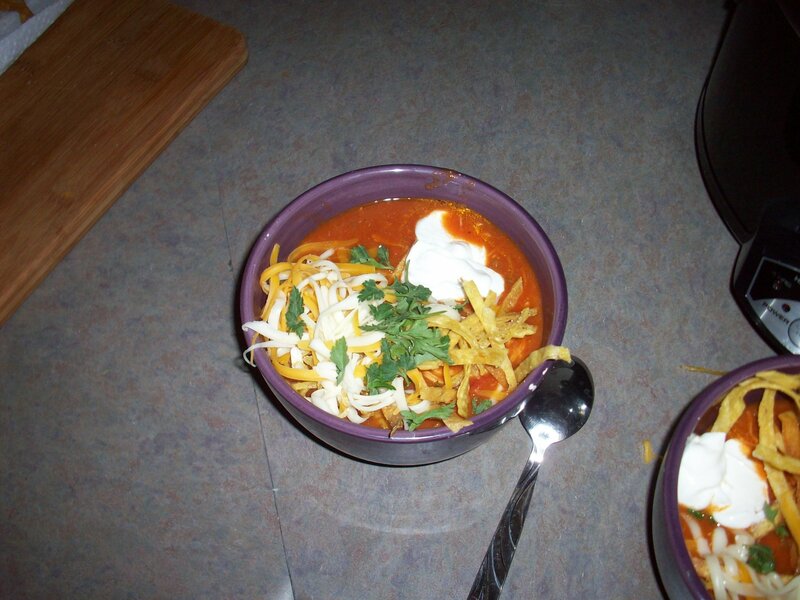 So I went to a friend’s apartment the other night, and had this amazing tortilla soup. He even fried up his own tortilla strips! He won’t tell me how to make it, but I did find out what’s in it. I may have to do some experimentation and try and figure it out. 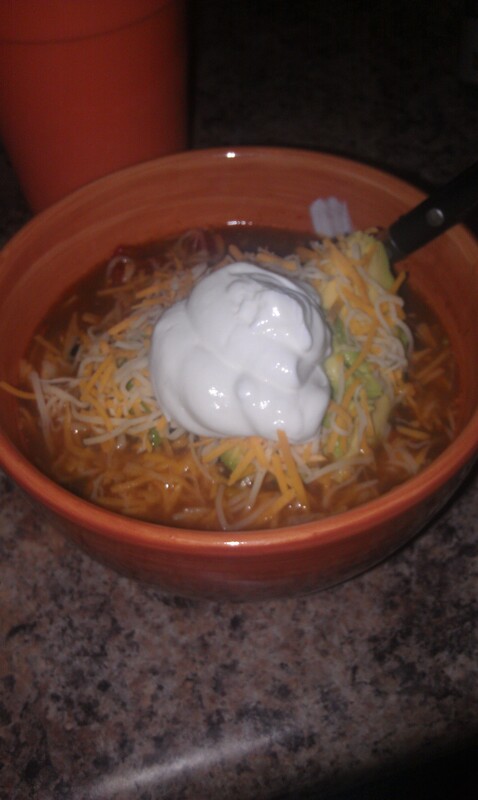 To top it all off were the tortilla strips and cheese and sour cream. A-Maze-Ing! This is what it looked like finished. Though once I got through with it all you could see was the bowl.